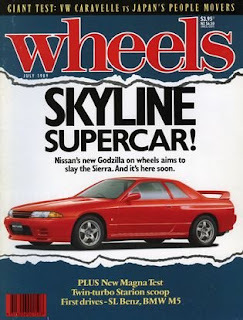 I was working in the office of Australia's Wheels magazine in mid-1989 when Nissan first revealed details of its all-new Skyline GT-R. Back then the car, now known mostly by its Nissan internal codename as the R32 GT-R, seemed like a high-tech road warrior from another dimension. That made the GT-R cover material for the July 1989 issue of Wheels. I can remember sitting around with editor-in-chief Phil Scott and a couple of Wheels staffers as we kicked around cover lines. Obakemono came up in the discussion. Scott, a hard-nosed newspaper-trained editor with superb tabloid sensibilities, seized on it. He didn't like the word -- no-one would know what it meant on the cover -- but he liked the Japanese monster idea. It was a simple step from there to describing the GT-R as "Godzilla on wheels". Which is exactly what we did. And a legend was born. R32 GT-R's never came in a red like this. Its much more of a maroon color.